Before you arrive, I recommend researching the local cuisine even if it's just to know the basics and the main dishes. Otherwise you could end up being totally confused. Watching a TV programme about the local food is a great way of learning (Anthony Bourdain has covered a lot of Asia). If you're interested in authentic local food then I'd suggest avoiding TripAdvisor as it massively skews to pleasing western tastes (of the food, location, decor, English-speaking, tourist-friendly). Every so often I try TripAdvisor and almost always the result is average food in a western-friendly environment where tourists are the only customers. Think about your home town... how often have you put a review of a restaurant in TripAdvisor? I imagine you've probably only rated places when you've been on holiday somewhere. That means that all the reviews are from non-locals, which is the opposite of what you want! Instead try to find an app or site used by locals (you may have to use Google Translate). For instance in Vietnam, there is an excellent app/site called Foody.vn used almost exclusively by locals (and it's all in Vietnam) - it's absolutely fantastic. The aim is to find the service with the most user activity from locals. Foursquare is usually a safe bet. Vietnam: My Vietnam food guide and Foody.vn. Malaysia: My Malaysia food guide. Thailand: My Thailand food guide, Wongnai and Mark Wiens' EatingThaiFood.com. Indonesia: My Indonesia food guide. Singapore: My Singapore food guide. Being a strict vegetarian or vegan in Southeast Asia can be very hard, especially if you want to experience local cuisine, but some areas are easier than others. To avoid meat is usually easy, but avoiding absolutely everything (like fish sauce, stock, shrimp paste, egg, etc) can be difficult unless you go to a western restaurant which accommodates for the many vegan/vegetarian tourists. In tourist areas you'll be able to find specialist vegetarian restaurants but you will find it harder in rural areas and if you're very strict then you may be forced to have something simple like fried rice just to make sure. Thailand: you can get tofu versions of most local dishes without losing any flavour. Because of this, I rarely eat any meat in Thailand. Vietnam: most of the local cuisine revolves around meat, so unfortunately you won't be able to experience much of the traditional food. However, of course you can still find plenty of options. Indonesia has a lot of fantastic traditional vegetarian dishes such as 'gado gado' and 'tempeh'. Malaysia caters pretty well for vegetarians, especially with the wonderful Indian food. Water: Apparently tap water in Southeast Asia is risky usually because of rusty pipes, so you'll be buying a lot of bottled water. Obviously it's a good idea to keep the costs down by finding the cheapest around (like 7-Eleven's own brand in Thailand) or buying in bulk. Some accommodation provides drinking water for free, so make the most of it. Ice: You might hear that you shouldn't drink anything with ice. I never worry about it and I don't get ill.
Iced tea: Iced tea is available throughout SE Asia, especially in Vietnam ( "trà đá") and Malaysia ( "teh o ais"), where you can have it with most meals for extremely cheap. I always have it without sugar. Vietnam is cheap. Bia hơi in Hanoi is about 5,000d and Bia Saigon is about 10,000d. Cambodia is also cheap. Angkor Draft is usually $0.50. Thailand varies depending on the area of the country but Chang, Leo & Singha are usually 50-100B. Juices & smoothies: You can find them in most places, in cafés and street stalls. Watch out for all the sugar that's added automatically unless you ask them not to. Young coconuts: In lots of areas it's easy to buy whole fresh coconuts to drink coconut water which is delicious and healthy. Don't forget that you can scoop out the young fresh afterwards for a tasty dessert. If there's not room to put a spoon in the top then you can ask the seller to open it up for you. Go to the markets and try every fruit that you can find! Some of my favourites are: durian, mangosteen, rambutan, longan, lychee, custard apple, jackfruit, star apple, dragonfruit and of course things like mango, pineapple, passionfruit, coconut, watermelon and banana. Go fruit crazy, especially if the fruit is in season. If you want to have a fruit juice or smoothie (watermelon juice is ridiculously refreshing) then I recommend asking for no sugar as most places will add at least one type of sugar to the deliciously ripe fruit. 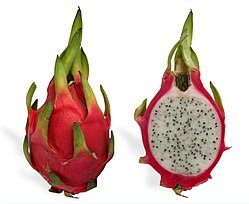 I'm starting with the king of fruits. Famous for its smell and hated by most tourists, I actually love it and eat it quite regularly. You should at least try it once and I recommend trying it as an ice cream flavour as it's more palatable. Closely related to lychees but I think I prefer them and they're easier to peel. Yum yum! Nothing like a mango. They're very sweet and delicious! A similar outside colour (a mixture of red and green) as normal apples but larger, more spherical and shiny. 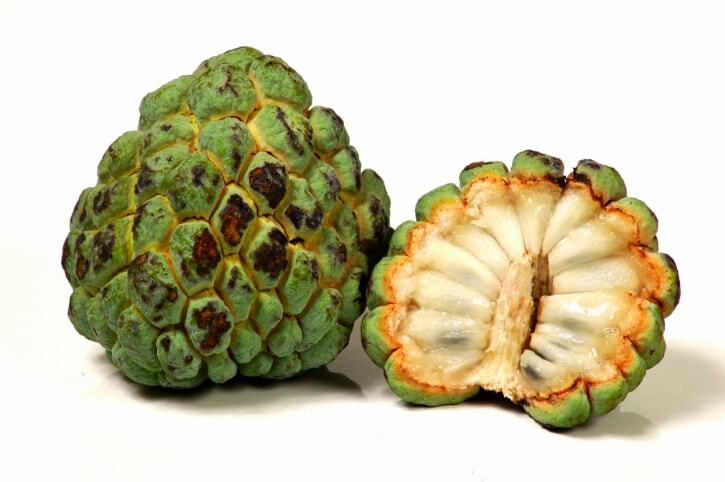 The inside is very milky and fleshy, not too different from custard apples. Very similar to lychee but probably more common in Southeast Asia. Must be very ripe to be tasty. They're sweet, kind of like a cross between a mango and tomato. I used to buy these back home from an Asian supermarket. It's definitely one of my favourites. 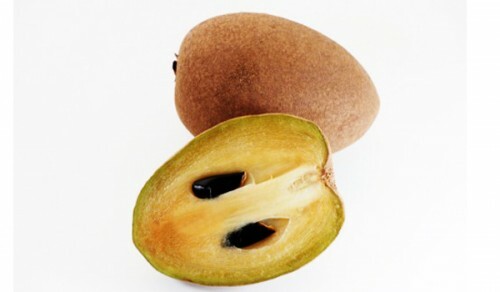 A custard-like flesh inside with fairly large seeds. Like a pear with brown sugar! Similar looking to a durian on the outside but far larger. Apparently totally unrelated to durian but I've always thought the taste is sort of like a cross between durian and orange. 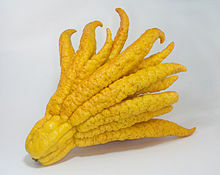 I really love jackfruit and find it hard to resist buying when I see it for sale. A very subtle flavour but eaten regularly all over Southeast Asia. It comes in two flavours: white-fleshed and red-fleshed. Like a sweeter version of a grapefruit. I find it pretty boring. It's very watery and the ones I've had didn't have much flavour. I'm sure you don't what a papaya is. Not sure why I've included it! Don't eat it, it's for decoration. I'd never seen it until I was in Hanoi where it seems to be sold on every street.